Posted On Thu, 21 Jun 2018 19:42:52 +0000. Filed in ramblings. By Vaibhav Bhandari. According to the Cybercrime report released by Cybersecurity Ventures in 2017, it is predicted that cybercrime will cost the world more than $6 trillion annually by 2021 and that it will be one of the biggest challenges that humanity will face in the next two decades. Protecting information, systems and our own personal devices from breach has become an inevitable part of our lives, owing to the growth in technology. This is where our Cyber Defenders program comes into play by setting the stage for the students by understanding, analyzing and implementing the security concepts to make a career out of it. 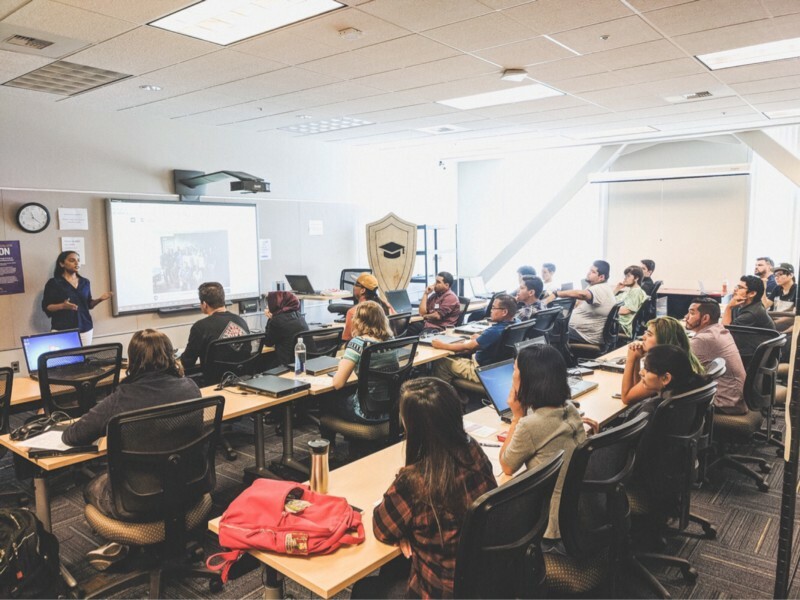 Cyber Defenders brings together Education, Government and Industry to create an immersive 8-week cybersecurity bootcamp internship for California based Community College Students. The focus of the program is to enrich the students with cybersecurity skills giving them a foundation and getting them familiarized through analysis, research and implementation of various projects and assignments, so that they are industry ready for a beneficial career in the field. One of the students from our 2017 program, Akshatha is currently working as a security intern at Silicon Valley Bank. During our orientation program on June 15, 2018, she gave a brief note on how the program helped her gain familiarity with Python programming, security modules, concepts of Machine Learning and how she was aided by the industry partners and program advisors through her tough times during the project implementation. Through the Cyber Defenders program, the students get to work in an environment that simulates a cybersecurity startup by implementing Agile methodology, creating accountability, tracking progress and identifying obstructions in completing the projects. The emphasis of the security project areas is primarily on Application Security, Blockchain & Cryptography, Malware Analysis with machine learning, Network security for IoT devices and Mobile App Security. The skill development track comprises of 25% of our focus providing the foundation of the concepts of cybersecurity. During the first week of the program, a Boot Camp is conducted covering a range of subjects like gaining insight of their career paths and interests, Penetration testing, Network security and Machine Learning. The students are also encouraged to perform Code Review by splitting them into the Red and blue teams whose intention should be to exploit the vulnerabilities and fortify the attacks respectively. In the second week, the students are imparted knowledge on Python for Cybersecurity by making them work on various small projects like Port Scanning, Packet Sniffing, Penetration testing, etc. and getting them familiarized with various security tools. Throughout the course of these two weeks, the students are given assignments, assessments and case study activities to strengthen their base. The major emphasis of the Cyber Defenders internship program is the project, which comprises of 45% of our focus area. Gauging the interest of the students and their research, they will be encouraged to form teams of 3–5 people. We help them to narrow down their focus area and direct them to the demands of the industry. We help them to figure out their project and help in planning ahead for timely completion and ensuring that they have a write-up describing their project and its technicalities to improve their documentation skills. On the last day of the program, industry partners and mentors are invited to review the project presentations of the groups and gain their insight. Comprising of 10% of our program’s focus, the students are provided with an opportunity to research and submit a report based on their intricate analysis and understanding of concepts, tools and incidents. This broadens their perspective and helps them to extend the knowledge into their project research and presentation, acquainting them with the depth of understanding required. They will also be encouraged to write blog posts based on their research and analysis and gain knowledge of technical writing. Another 10% of our program’s focus is on Networking and Activities. Guest speakers, who are cybersecurity industry experts, are invited to give a brief introduction of their domain, for the students to leverage the speaker’s expertise and knowledge. They also provide lectures on specific security topics to impart knowledge and provide them insight. The students are encouraged to leverage the communication medium, contributing to open source projects on GitHub related to cybersecurity. Competitions like Capture the Flag (CTF) and Hackathon are conducted involving teams to compete against each other. They are motivated to reach out to industry partners and connect with professionals. A new addition to this year Cyber Defenders program is focusing on the Career Development aspect. A dedicated 40 hours of training in partnership with YearUp! is provided to the students to hone their communication and etiquette, refine their resumes and cover letters and interactive lessons to elevate their public speaking skills. Business cards with the names of the students will be provided to them, to help network with the industry professionals. This track shall have 10% of the total emphasis of the program. Through the Cyber Defenders Internship program, we strongly believe that our training, resources and aid will thoroughly benefit the Community College students to start their career in the field of Cybersecurity and provide them the boost needed to have a successful future. What to help? Drop us a line….